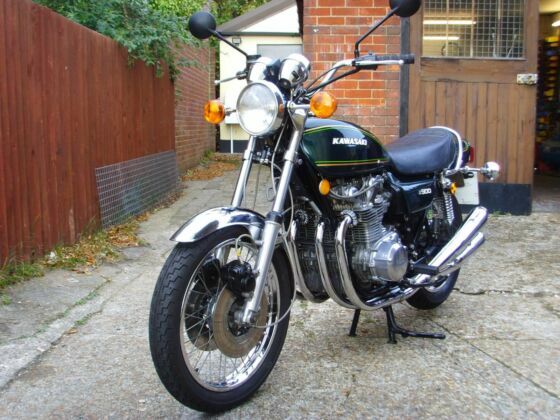 The 1972 Kawasaki Z900 is a classic naked bike and is powered by a 903cc inline four engine which puts out 82bhp. The original Z1 was powered by an air cooled 903cc inline four cylinder four stroke engine, producing 82bhp at 8,500rpm and maximum torque at 7,000rpm. The cylinder block was painted black and dual front discs were an optional extra. The 19" front wheel takes a 3.25H tyre and the rear 18" a 4.00H. 1974 Z1A: Silver engine, previously partly black. 1975 Z1B: Low handlebar option introduced. 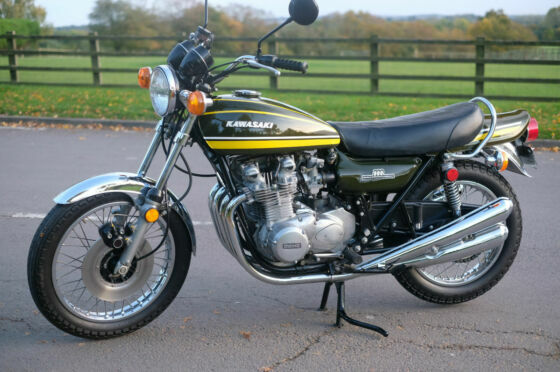 1976 Z900: Name change to Z900 (KZ900 in the USA), 26mm carbs, down 1bhp to 81bhp, new frame and dual front discs standard (previously a factory option).